I've only changed the table and the rug but what a difference already! 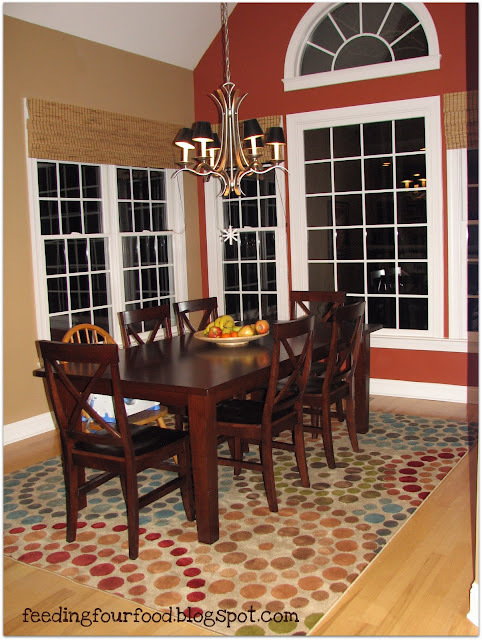 The table and chairs are from Pier 1 and the rug is from Target.com. I loved the idea of the rug but wasn't sure how much I would like it in person. But, Target.com was running a 15% off deal with free shipping and in-store returns so I figured I'd give this new rug a try. I'm so glad I did. It works perfect with the accent wall color and even the colors and style of my living room, which is open to the dining room. I'm very happy with the new table and chairs, although they took a little getting used to since it's so different from the old set. I've always wanted a big farm table though. We only purchased 6 chairs for now. We want to do different head chairs eventually. For now, we've got the baby's booster seat on one of the old chairs. I've been pleased with the finish on the table. I was worried about scratches and water marks at first but the table has distressed accents so it's already "broken in" and any minor scratches and bumps we've already incurred just blend right it. Buffet serving piece. When I purchased the table and chairs from Pier 1 I signed up for their credit card and earned enough points with the purchase to get $120 in store credit. I also got a 20% off coupon for my next purchase, and sold the old table and rug on craigslist. All this combined will be enough to get the buffet I want free. Love it. Just waiting for my gift cards to come in the mail. Chandelier. I'm keeping the chandelier but it needs to be lowered by about a foot. We've got 20 ft ceilings in the dining room so I need to hire an electrician for the job. Drapes. Still my biggest challenge. I have shopped everywhere for drapes and picked out a handful of samples from Jo-Ann fabric to make my own. So far, no luck. With pre-made drapes, the length is the problem. Most drapes come in 84"-96" and I need 100" or more. And I just haven't found a fabric that I'm in love with to make my own. Will keep looking. Artwork. Am deciding between keeping my old artwork (above), putting up black-and-white family photos in these cool Pier 1 picture frames , this sunburst mirror, or framing photocopies of some gorgeous John Lawrence illustrations from children's picture books. I don't think I'll be able to decide until I have the buffet and drapes in place. Stay tuned for Phase Two! Canteloupe doesn't come in season in North Carolina for several more months, but I'm seeing them on sale more and more at the store. One of my favorite ways to eat canteloupe is smothered in the yogurt mint sauce served at our favorite Indian restaurant. I thought I'd try to make a smoothie that captures this unique taste sensation. This recipe is a refreshing version with the lightly sweet melon, fresh mint and a sprinkling of cayenne pepper for heat. The texture is thinner than a traditional smoothie, but adding ice just waters it down. 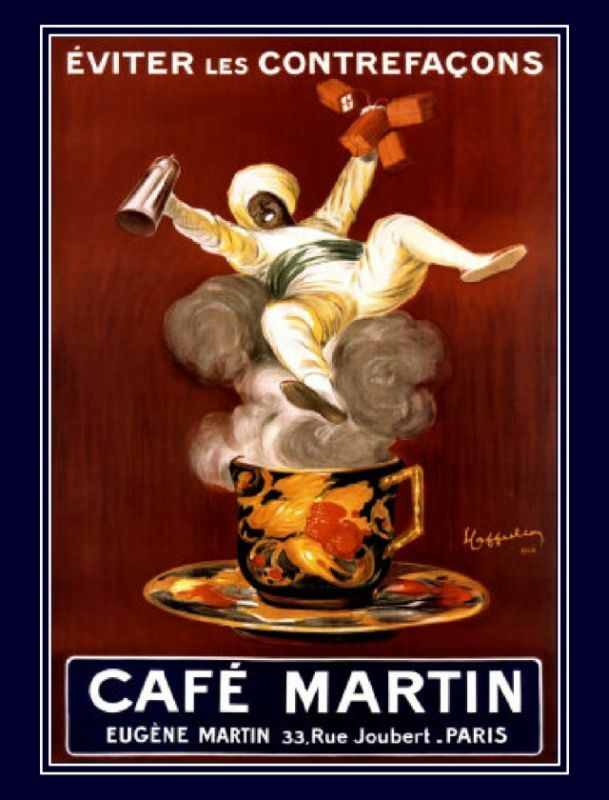 Top with a fresh sprig of mint and a sprinkling of cayenne pepper and get your morning off to a great start. 1.) Place canteloupe, mint and honey in blender. 2.) If using yogurt and milk or soy milk, then add the yogurt and blend, adding milk/soy milk until you get a smooth consistency. You may have to add more honey than shown above if you're using plain yogurt. 3.) 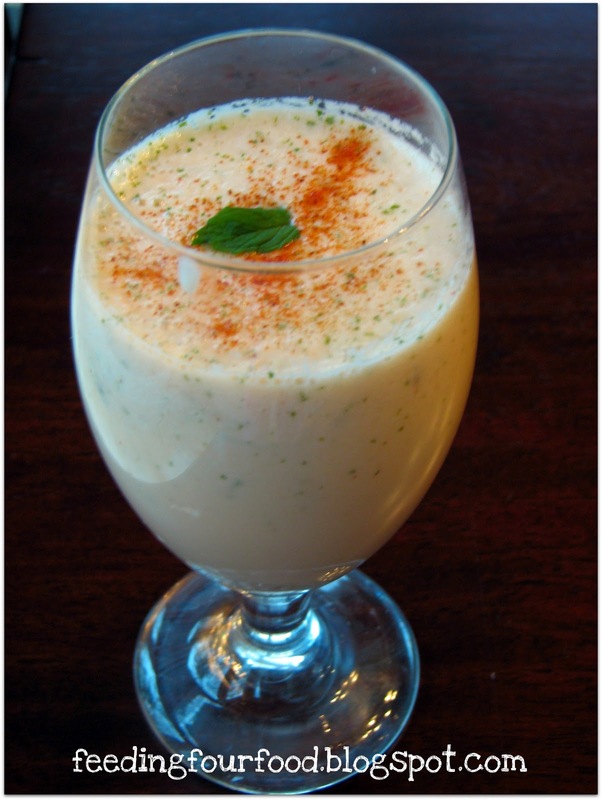 If using kefir, blend ingredients, adding kefir as you go until you get the desired consistency. 4.) Top with a fresh mint sprig and a sprinkling of cayenne pepper. Wow, I have forgotten my own blog's birthday. So typical of me. I swear I meant to send a card. March 10, 2010 I wrote my first blog entry and despite not being given a book deal or becoming famous, at all, I've posted 62 times during that year. Honestly, I just love to cook and write about it. Thank you so much to those of you who have said, "Hey, I saw that post on your blog" or who have commented on my Facebook entries or shot me emails. You rock! It makes my day to talk to other people who love food and cooking for their friends and family as much as I do. 1.) 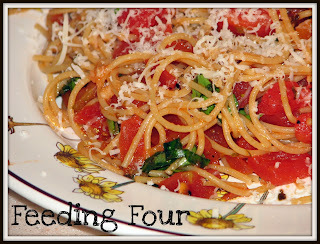 Visit feedingfourfood.blogspot.com before April 1, 2011. 2.) Scroll down to the Followers section. 3.) Sign up to follow my blog. 4.) Bonus points: Share my blog with your friends. I'll do a drawing for the gift card after April 1. It's that easy! Pre-made tortelloni or ravioli are a huge hit at our house. 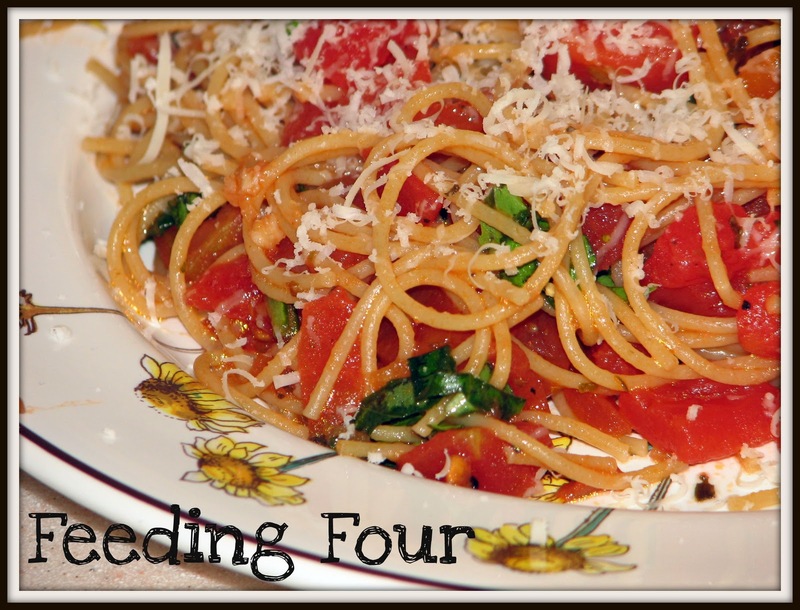 We usually eat them one of two ways--in red sauce or with olive oil, salt and pepper, and Parmesan. Boring after a while, and not so diverse on the dietary scale. So here's a little something to liven them up and get lots of yummy veg while still being quick and easy. I substituted half and half for heavy cream to cut out hundreds of calories and a load of fat. If you can find whole wheat or low-fat tortelloni, all the better. This might be one of our new favorite meals! And if it's Buitoni that you like, here's a way to get a $1 coupon on your next purchase. 1.) Saute vegetables and garlic in olive oil or add a splash of water and place the lid on the pan to steam the veg just until tender. 2.) Meanwhile in a separate sauce pan, heat butter and half-and-half until butter is melted. Cook 10 minutes or until cream thickens slightly. Stir in lemon juice and zest. Add salt and pepper to taste. Let cool slightly. 3.) Cook tortelloni according to package instructions and drain. 4.) 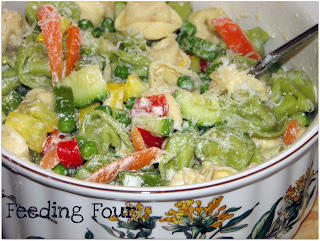 In a large serving bowl, gently combine the tortelloni and vegetables with the sauce. Stir to coat. 5.) Serve with Parmesan cheese and any fresh herbs if you have them on hand. First, the sob story. I think it will help you hate me less as I share the journey of how I am about to make over my dining room. Rich and I are both spending-averse to put it nicely. We pride ourselves on DIY projects and using credit as little as possible, so it's taken us almost ten years to furnish the house we built together back before we had babies. I also tell you this so you won't be appalled as I share the pictures of my current dining room. I know, this is killing any hopes for foodie street cred. Where do I find a camera lense that makes this room look more cool? The Rug: The rug was a hand-me down from a restaurant in Chapel Hill that went out of business. Nice actually, but not our taste at all. The cat also uses the rug to vent his frustrations when we don't let him out the nearby backdoor fast enough. And fringe. I. Hate. Fringe. Pre-kids I would get down on my hands and knees and straighten the fringe with my fingers. Rich would just sigh and shake his head. As you can see from the photo above, the fringe has not been touched in years. The Table: A discontinued, harvest-style table from Crate & Barrel. 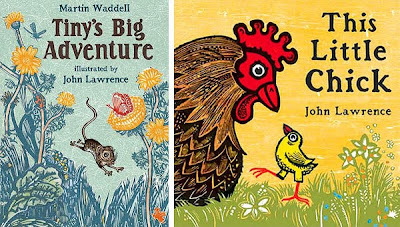 More contemporary and along the lines of our tastes. But have you ever tried to find a 54-inch square table cloth? Nearly impossible. And it has gotten a bit wobbly over the years. Plus I want a table with more presence, one that doesn't look dwarfed by the vaulted ceilings and tall windows. 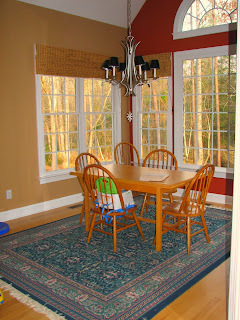 The Windows: One of my biggest challenges will be finding drapes that do these windows justice. I love the view of the woods out back of our house, but I don't like valances or sheers. I want a sassy, bold drape that helps with the sun/heat issue but doesn't take away from the light or interfere too much with the architectural feel of the trim. They'll need to be at least 100 inches to reach the floor, easy to clean, and I don't want to spend too much money. You see why I saved this room for last? So the parameters. The budget--is my own business, no offense. And did I mention that I'm not big on shopping? Shopping with kids in tow is akin to torture, and when I have free time without them I'll be darned if I spend it in a store, any store. Maybe in ten years... Yeah, I'm sure they'll embarrass me in public then too, but at least they'll be old enough to carry their own change for the bus ride home. I do a lot of research online and then check stuff out in the store when I'm 99-percent sure I want it. Unless of course, there are special online deals with free shipping and an easy return policy. Cue angelic choir. Also, we use our dining room for formal and daily meals, game night, craft center and kids' art display and chalkboard wall (photos of that for another post). Our taste is decidedly modern but I love to mix things up. Rich loves ultra contemporary with industrial details but I prefer a more eclectic modern design inspired by nature--earth tones mixed with bright colors, wood, baskets, stone, pottery. We agree on modern, clean lines and a casual, fun and comfy atmosphere. I won't be able to have my dream dining room--I can't afford it! 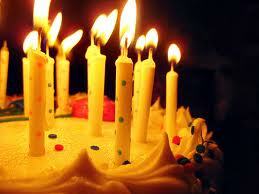 My hope though is to come up with something that's fun and inviting that will last us another ten to fifteen years. So check back in with me from time to time and I'll post photos of the room in progress--growing pains and all. Recently, after checking out at my local Target, the cashier handed me the usual wad of store coupons with my receipt. 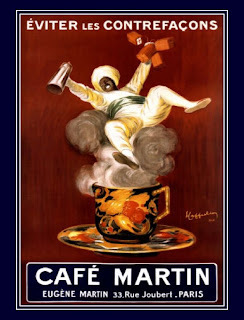 In the stash was a coupon for a FREE three-pack of Starbucks' answer to instant coffee, Via. I see Via advertised all the time when I'm going through the Starbuck's drive-thru. I haven't tried them because, well the point of Starbucks coffee is going to Starbucks. And I don't see myself spending $1 a packet to make my own coffee when I can get an entire bag of Starbucks coffee for $7 at the grocery store and brew enough to last a week. Obviously, I am not the target market for this product. But FREE is FREE my friend so I dutifully carried my coupon around in my wallet until the next time I was at Target. I grabbed what I thought was a three-pack of Starbucks, valued at about $3, and checked out. Only when I got home did I realize they had mis-shelved the packages and what I had was an eight pack, valued at $8. Fuming, I pulled out my receipt to see if I had, indeed, payed $5 for coffee I hadn't wanted. But no, the discount rang up for the full $8. Kaching! So, moral of the story, if you get one of these coupons, go for the eight-pack girlfriend. Any who...how's the coffee? 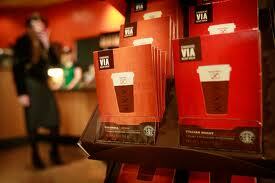 If you like Starbucks' coffee (and I do, oh I do), you will probably like the Via. I tried the Columbia brew and it tasted and even smelled just like the real thing. I don't know how they do it. Starbucks magic in a little foil package. When they sell it by the can I'll be first in line. And it is currently 10:30 p.m. and I am blogging away with little desire to fall asleep, so yes the caffeine content is on par too. Recipe from the Complete Cooking Light Cookbook, 2000. Drain and rinse beans in a strainer. Boil pasta until al dente. Drain in the strainer with the beans to warm up the beans. 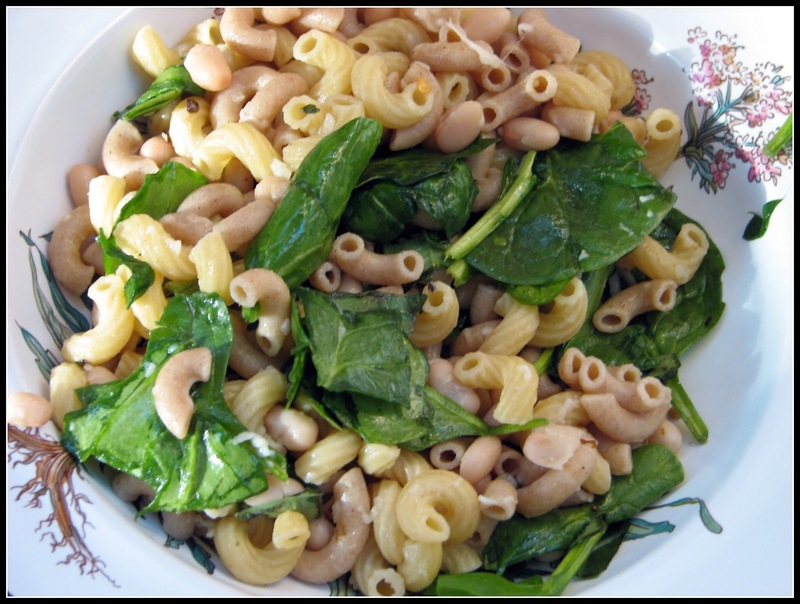 Toss all ingredients in a bowl while pasta is still hot and spinach wilts slightly. Top with extra cheese if desired and serve warm. Also great as a cold salad the next day. Lisa at Sweet As Sugar Cookies is having a Sweets for a Saturday linky party. I've posted the Vianne Rochon Maya Brownies recipe and there are over a 100 other great sweet treats to check out.Thanks, Lisa, for the invite and stay safe there in Hawaii. "Why can't you wear black shoes like the other mothers?" One of my favorite movies is Chocolat with Juliette Binoche, Alfred Molina, Leslie Caron, Judi Dench, Carrie-Anne Moss and, of course, Johnny Depp. Vianne and her daughter Anouk stir up trouble when they move into a religiously rigid French town and open a chocolaterie in the middle of Lent--right across from the church. What ensues is a tug-of-war between the town's dour sense of morality and decency and the freedom and pleasure represented by Vianne's "dangerous" chocolates. The story is based on Joanne Harris' novel of the same name, and, for once, I prefer the movie. Harris' novel starts with the same sparkling, intriguing characters and setting but takes a dark and cynical turn that bursts the bubble halfway through. In contrast to the book, the movie's Vianne is one of my favorite cinematic characters, and I find the themes of faith, love, friendship and joie de vivre deeply satisfying. The story is perhaps a bit sweet but finds redemption in the stellar cast, transportive soundtrack (a mix of gypsy jazz, a la Django Reinhardt, and Latin, pan flute instrumentals), and sets that drip with nostalgic post WWII images of France. I know, traditionally we fast things like chocolate during Lent and then celebrate by breaking fast at Easter. 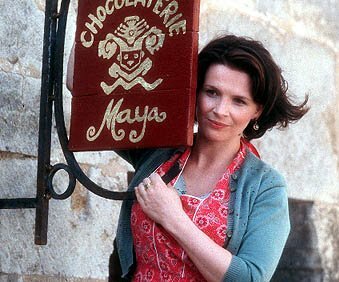 But watching Chocolat again today inspired me to celebrate Lent and the sacrifice Christ made once for all a little early with these Vianne Rochon Maya Brownies. They're rich and chocolaty with a crisp top and dense, moist crumb. As Vianne adds Maya-style spices to her chocolate in the movie, I added cayenne pepper and cinnamon for heat and spice and coffee for depth. Enjoy every morsel. Using a double boiler, or a bowl set over a pot of boiling water, melt the chocolate chips and pats of butter. Stir constantly. 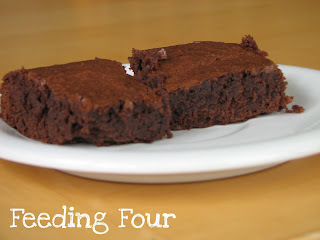 When you see just a few chunks of chocolate and butter remaining, remove from heat and continue stirring until smooth. Add the cocoa powder through the coffee powder. Taste to see if you want to add any more heat, spice or depth. Stir in the sugar and vanilla. Let cool slightly. Add the eggs one at a time, mixing thoroughly. Pour batter into a buttered 9" pan. Pasta Margherita, inspired by the pizza of the same name, is an easy way to take ordinary pantry items and liven them up with fresh herbs and cheese. If your family isn't big on large chunks of tomato, you can also puree the sauce before tossing it with the spaghetti. I used shaved Parmesan on this meal but it's also good with the grated kind, in the green canister. Enjoy--the dinner and your free time, because this whips up in a snap! 1.) In a sauce pan, combine diced tomatoes, minced garlic, red pepper flakes, and oil, salt and pepper to taste. Cook on low until heated through. 2.) Meanwhile, boil pasta until al dente. Drain. 3.) Add the pasta to the sauce and toss. I use tongs for this and add the pasta a little at a time to the sauce. Err on the side of having it too saucy. The pasta will soak up some of the liquid and you don't want it too dry. 4.) Chop basil and toss with pasta. 5.) Serve with grated Parmesan. 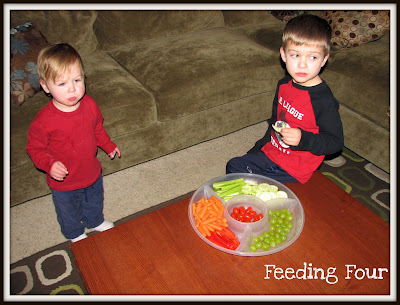 Just thought I'd share this little trick that's helping our family get more fruits and veggies and make healthier snack choices. As you know, our New Year's resolution this year was to cut back on the meat in our diet and insert more fruits and veggies and whole grains. One way I've started doing this is to cut up and wash an assortment of fruits and veggies at the beginning of the week and keep them in a snack tray in the fridge. I replenish the dish throughout the week with fresh choices. My boys are loving this. The snack tray has really come in handy during Monster Hour, that time right before dinner when they're the hungriest (and grumpiest) and I'm trying to cook. They think it's neat to eat out of a tray we usually reserve for parties, and they get to snack while they wait for their meals. Maybe they're ruining their appetites for dinner, but it's with foods I want the to eat anyway, so it's a win-win. The other advantage of the snack tray is that if I'm cooking with a recipe that calls for the items in the tray, they're already prepped. And dinner time salads just got a whole lot easier. I hand out bowls of lettuce and let everyone choose their own ingredients. I don't usually include a dipping sauce, but some of my boys' favorites are Italian dressing and any of the Newman's Own low-fat vinaigrette dressings--lime, raspberry or ginger. For fruit, try yogurt, pudding or peanut butter or mix up a cream cheese "frosting" with cream cheese, lemon juice and a little bit of powdered sugar. Have fun with it!